Roasted Green Bean Summer Rolls | Naturally. In the grand scheme of summer produce, green beans may be low on your list. I know for me, I’d often pick up a pound or two to have as a quick side along veg burgers. Or, I’d come home from the CSA with a sizable haul and would have no clue what do to with them. I assure you though, green beans make a really nice star of a recipe. While these green bean summer rolls are a favorite of mine, I’ve also been eating quite a bit of this green bean egg skillet. Just recently I jazzed the skillet up with peppers and soy sauce mixture. 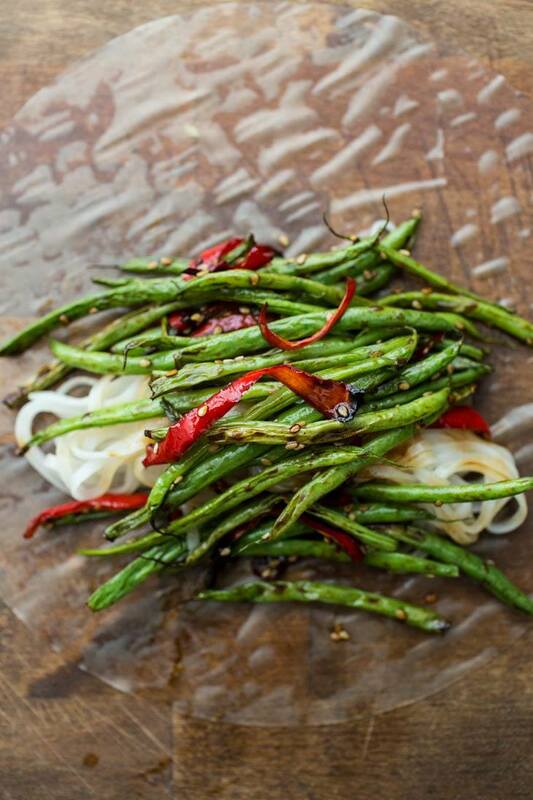 Green beans are an easy grab from the market and I encourage to try a recipe showcasing their fresh summer flavor. Speaking of these summer rolls, I wanted to mention the peppers I used. If you’ve been following along on my instagram, you might have noticed some red peppers I picked up from the market Saturday. I’m not a big fan of bell peppers and much prefer the Italian variety. I always grow green Italian peppers every summer and these red ones are a variety called Jimmy Nardello. They are a sweet pepper, fry and roast well, and I think have a nicer flavor than the red bell peppers. For today’s pairing, I’m going to take a slightly different approach and encourage you to pack a picnic! With a little care, these summer rolls travel well and can make the perfect thing to pack up for a road trip or outside adventure. Part of the reason I love these summer rolls is because I feel no sauce is needed which means easy travel! Quick side note, while I typically store everything in glass at my house- I’m a bit more leery of it for traveling (I’ve broken 3 glass water bottles). I’ve fallen in love with these stainless steel ones (perfect for short-term storage). I picked up the 3 tiered container and you can easily fit in these green bean summer rolls (cut in half), some noodle salad, and a couple of cookies. Which brings me to what you should pack! Main: Pack a noodle bowl! I prefer this garlic soba and zucchini noodle bowl, Chili Spinach Pesto Noodle Bowl, or this carrot noodle bowl with Sriracha tahini. These Green Bean summer rolls are a lovely summer treat that are already gluten-free (when making sure to pick up tamari + noodles marked GF) and can easily be kept vegan with a good substitute for the honey. Preheat oven to 400˚. If green beans are thick, slice in half lengthwise. 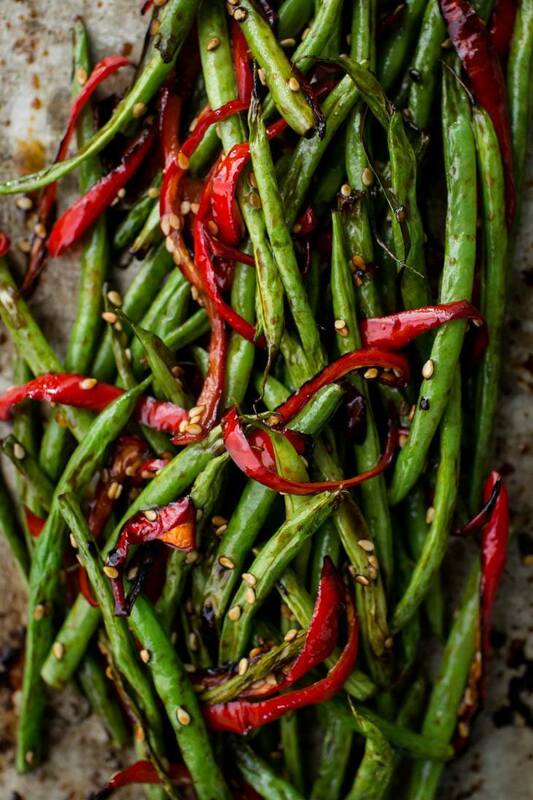 Cut red pepper into similar sized strips as the green beans and toss together with olive oil on a roasting pan. Spread out into a thin layer and roast until green beans are tender and starting to brown, 15 to 20 minutes. In a small bowl, stir together soy sauce, honey, and ginger. Right after you pull the green beans from the oven, pour the soy sauce mixture over, sprinkle with sesame seeds, and toss until the green beans are coated. Allow to cool slightly, tossing mixture occasionally. Cook the noodles according to the package. Drain and rinse under cool water. Set up your rolling station with the hot water, bean mixture, rice noodles, and a place to roll/cut each summer roll. Soak the rice paper for 10-15 seconds, until pliable but not extremely soft. (Soaking time may be longer or shorter depending on water temperature.) Place the wrapper on the cutting board and add 1/4 cup cooked noodles and roughly 1/2 cup of the green mean mixture, lying them slightly off center, towards you. Fold the wrapper edges closest to you over the filling, tucking the edge under the filing. Fold the sides over and continue to roll away from you. Repeat with remaining ingredients. + I prefer to use French green bean variety for these. These beans are longer and skinnier- perfect for roasting. However, you can use any variety of bush bean or even cut down pole beans to a similar length. + I’ve always added rice noodles to my summer rolls, primarily because when eating them as a meal, I need a bit more substance. However, you could easily swap out the brown rice noodle for your favorite green. + Storage: Whether leftovers or wanting to make the day before, wrap the finished summer roll in a damp towel (or paper towel) and place in an airtight container. You’re goal is to make sure the rice paper doesn’t dry out. These summer rolls are best eaten within 24 hours of being made. 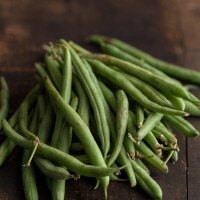 Green beans are definitely on my list of favorite summer produce! 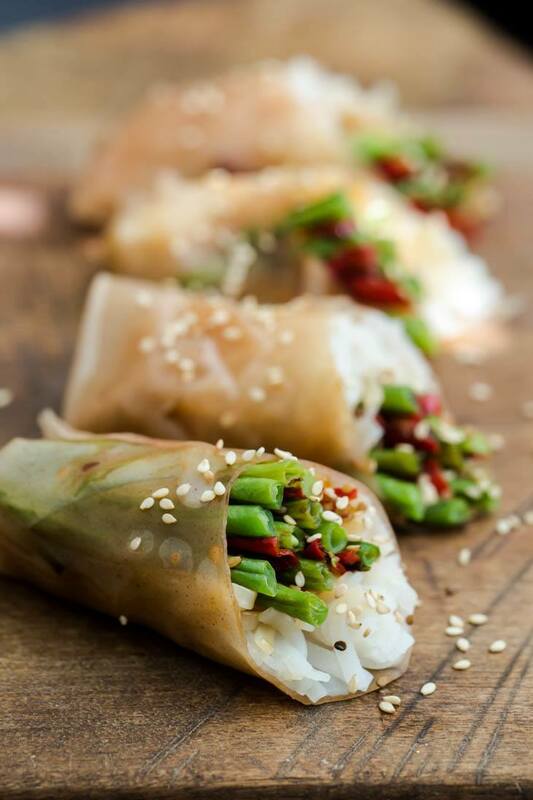 I love the idea of wrapping them up in rice paper for a simple and delicious roll. Yay! These look so good–nice photos! Oh wow, Erin… love the creative approach to green beans… Yum! I always love a new rice paper roll combo 🙂 perfect summer meal! I’m so guilty of neglecting green beans and/or grabbing them when I’m totally uninspired. 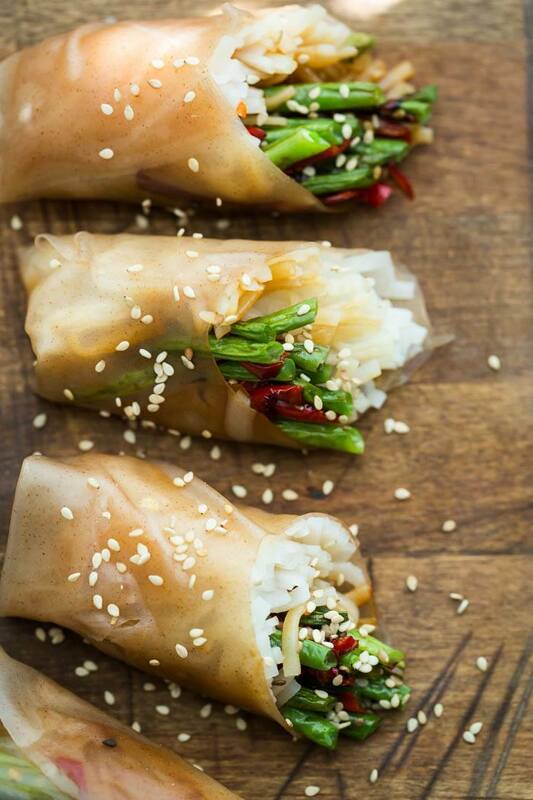 I’ve never thought to put them into spring rolls, but these look delicious! So need to try this myself! These are beautiful. I think you could get any kid to eat their vegetables if they were served up like this! Oh my goodness, I’m always in awe of your simple yet creative ideas. These look perfect for late summer, yummy! This looks great. Got a packet of rice paper in the cupboard and was looking for new ideas. Have never thought of roasting beans either, lovely. This looks delicious! I’d always heard these were called summer rolls, and that they are only spring rolls when fried. Summer rolls are definitely tastier though!